Skype for iPad users can now use Slide Over to bring another app (or Skype) into view temporarily. 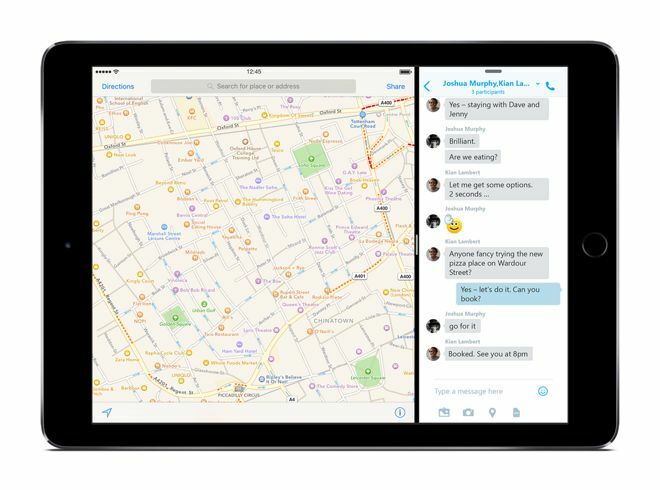 On an iPad Air 2, Mini 4, or the upcoming iPad Pro, Split View allows Skype to run simultaneously alongside a second title. Both iPad and iPhone users can reply to chats from lockscreen notifications, or start one from iOS 9's Spotlight search. Tapping on a Skype contact located in search results will launch directly into a chat. Both apps are free downloads, and will run at least basic features on devices with iOS 7 or later. iOS 9 was only officially launched on Sept. 16, and many popular apps are still in the process of upgrading to support it. Making things more difficult is that Apple has already issued two point releases, the most recent being Wednesday's 9.0.2..